Got a question? Not to worry, we are here to help! All bookings cancelled regardless of notice given will incur a $50 refund processing and admin charge. All bookings cancelled with less than 10 days notice prior to the date of check in will incur a 100% cancellation fee. Our two kitchens are fully equipped with everything you need for your visit to us. We have two gas BBQ’s, two gas hobs, plates, cups and cutlery, chopping boards and knives, pots and pans and two fridge/freezers plus plenty of cupboard storage. We even have a washing machine that you can use complimentary. DO YOU HAVE KITCHEN APPLIANCES? Due to our retreat running off solar power we do not have any kitchen appliances as items that generate heat quickly can cause our power to cut off. However, we have kettles for the hobs and you can toast on the BBQs. There is not an oven. Our two gas BBQ’s are indoors in the communal kitchens. There are no outdoor BBQ’s but our camp fire is there if you wish to cook something over that. Nope! All hotel linens are provided in the tents which includes your bottom sheets, top sheets, doona/duvet cover, pillows and pillow cases. Blankets and hot water bottles are provided through the winter months. DO I NEED TO BRING A SHOWER TOWEL? Shower towels are provided so please bring a beach towel. We provide eco-friendly Shampoo, Conditioner and body wash as the facility is on a sceptic and water treatment system so we are conscious about what we put back out in to the environment. Toothpaste is fine so please bring that, we but we kindly ask that you use our toiletries provided to help us look after this beautiful island and our environment as a whole. DO THE TENTS HAVE POWER POINTS? All tents have power points that can be used throughout the day and evenings but can’t be left on over night. There are also plenty of power points in the kitchens. IS THEIR AIR CONDITIONING/CEILING FANS IN THE TENTS? There isn’t due to our Retreat running off Solar Power. However, the tents all have plenty of windows that unzip to allow the sea breeze to come through. ARE THE TENTS COLD IN WINTER? June – August is official Australian Winter (also the dry season) and it does get very cold on the island. We advise that you bring warm clothes for the evenings when the temperatures drop. We do provide plenty of blankets and hot water bottles for these cooler months. ARE YOU SITUATED WITHIN THE DINGO FENCE? 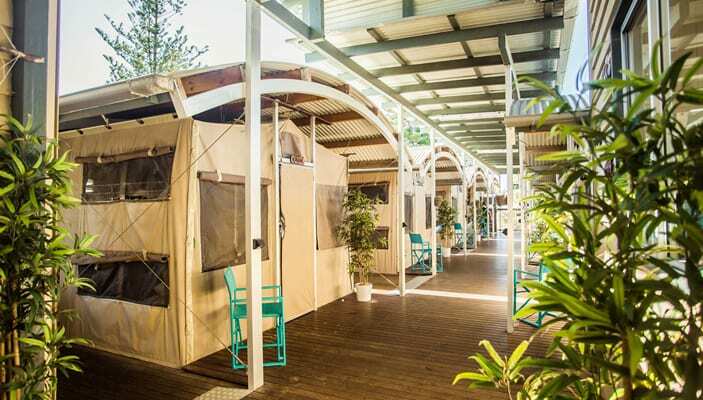 Beachcamp is safely situated within the Dingo Fence so you can relax and enjoy your time here. There is a black gate that surrounds the community and we have our own private access to the beach if you want to walk down there. You will drive over an electric cattle grid when you enter the “dingo safe” area. Super close! 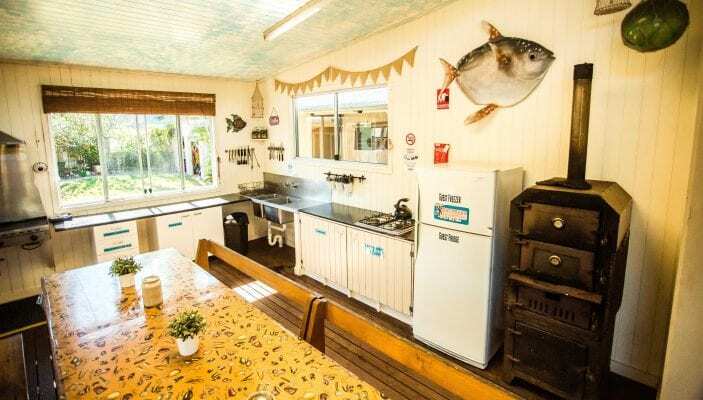 No more then 100 meters from 75 mile beach and there are beautiful sea views to be seen from Beachcamp Retreat. Lake Wabby is situated 5km up the beach from us and is a 2km walk inland to get to. Lake McKenzie and Lake Birrabeen are around a 45-1 hour drive inland to get to. CAN YOU HAVE A CAMP FIRE AT BEACHCAMP? DO I REALLY NEED A 4WD TO EXPLORE K'GARI - FRASER ISLAND? In short, yes! There are no roads and no public transport here. Your options are to hire a 4WD or to join a tour from the mainland. None of the sights are in walking distance either. We offer 2 and 3 day tours with our company Drop Bear Adventures. This is suitable for 15+ years and is a great option if you don’t feel confident driving a 4WD by yourself. There are also bus tours that cater for families with children under the ages of 15 years old. Please feel free to ring our team who are always happy to help and advise so you have the best experience here on K’gari. IS THERE ANY PUBLIC TRANSPORT ON THE ISLAND? There are no buses on Fraser Island but there is a taxi service ran by our wonderful friends Steve & Lisa. Please get in touch with them directly to sort out transport if you require this. IS THERE A RESTAURANT NEAR THE BEACHCAMP? Our retreat is based in Eurong Second Valley which is just a short walk from Eurong Resort. They offer dinner each evenings in their resort and this is a buffet style dinner. You can walk there within the dingo fence too. IS THERE A FUEL STATION ON THE ISLAND? There is a small fuel station in Eurong where you can fill up but it is more expensive then the mainland fuel prices and we recommend that you have a full tank before coming to the island. WOULD YOU RECOMMEND 4WD WITH YOUNG KIDS? One of the main attractions for coming to Fraser Island is the 4WD experience. Being the largest sand island in the world means there is a lot of driving involved to get to the different lakes and creeks around the island. We recommend not hiring a 4WD if you have children under the ages of 3 years old unless you are highly experienced. The inland tracks can be very bumpy. IS THERE A SHOP ON THE ISLAND? There is a small shop in Eurong that offers a small selection of fresh and dry foods, confectionary, alcohol and tobacco and souvenirs. We do advise that you purchase your food from the mainland though as it will be cheaper for you. WHAT IF I WANT TO DEPART FROM HERVEY BAY? There is a barge that departs from Hervey Bay a few times a day and must be booked in advance. 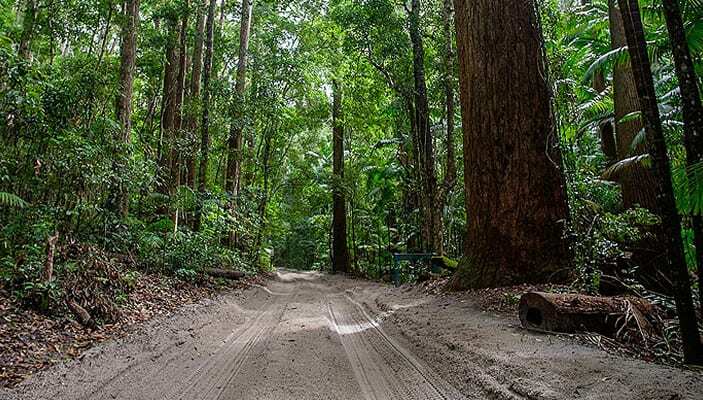 There are also plenty of 4WD hires and tour companies based in Hervey Bay too. If you are hiring a 4WD from our company then you can only pick it up in Noosa and return to Noosa. HOW LONG WOULD YOU RECOMMEND FOR EXPLORING FRASER ISLAND? We recommend at least 3 days/2 nights on Fraser Island so you can see plenty of the beautiful sights and also get that relaxing side to your holiday. Tides and weather can also affect your itinerary massively so it’s best to give yourself 3 days here. But in other words, the longer the better! CAN YOU DRINK THE WATER ON FRASER ISLAND? Yes! It’s some of the freshest water in the world so please avoid bringing bottles of water. ARE THE MOSQUITOS BAD ON FRASER ISLAND? Mosquitos and March Flies are pretty persistent on the island during the summer month so it’s always best to bring insect repellent! IS THERE ALWAYS POWER AS IT'S A SOLAR RETREAT? Of course running off Solar means that we have to rely heavily on the the sun shining, which being in Australia is pretty consistent! However, those rainy days can affect our power but we do have a back up generator that we put on so there is always power. 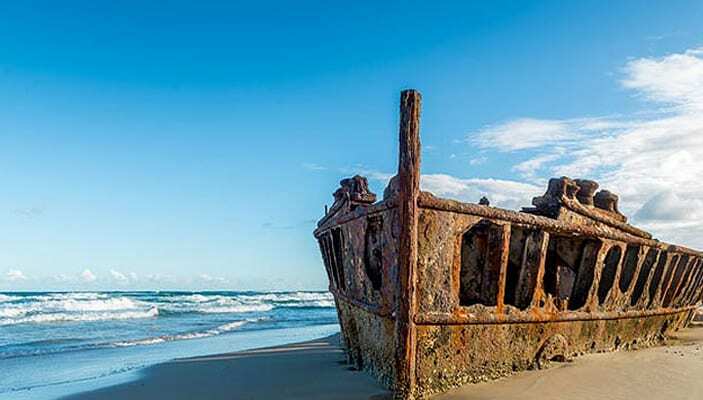 Along with its natural beauty, Fraser Island also has some natural dangers and if you don’t know what your doing it can be an unforgettable experience for the wrong reasons. Listen to our staff when they brief you about the dingos and wildlife and stick to the rules of the island and you will be fine. You can access Fraser Island either from Rainbow Beach/Inskip Point or from Hervey Bay. If you are coming up from Brisbane/Sunshine Coast then it is best to go head to Rainbow Beach and access the island there. You need to purchase a barge ticket and vehicle access permit and this can be brought on the day at the Rainbow Beach Shell Petrol Station. Once on the island we are a 40 minute drive up the beach. If you are coming from Hervey Bay then you must book the barge in advance as they only depart 4-5 times a day depending on the time of year. It will then be an hour inland drive to get to our retreat. It is best NOT to do this drive in the dark so please try and catch a day barge rather then the late one for your own safety. CAN I SWIM IN THE SEA? You are strongly advised to NOT swim on Fraser Island due to the extremely strong rip tides, jellyfish and those big old sharks. Please do not swim when you are staying with us at Beachcamp. There are plenty of lovely freshwater lakes that are perfectly safe to swim in. CAN YOU BOOK OUT THE WHOLE RETREAT? Yes! We often get guests booking the whole retreat out for their families and it is the perfect spot to have a get together! We offer 10% off when you book all the tents and so if this is something that’ll interest you then please get in touch with us directly. Then ring our super friendly team or pop them an email! We’re always super happy to help.